Seems like The Friends are heading to Chattanooga a lot lately. On our last trip with the family, we visited the Boathouse at the suggestion of our friend, Will. 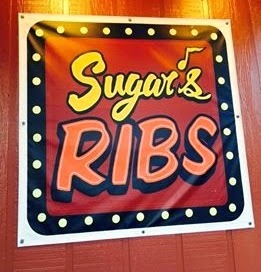 When Will recommended the Boathouse, he also gave the thumbs up to the Boathouse's sister restaurant, Sugar's Ribs. 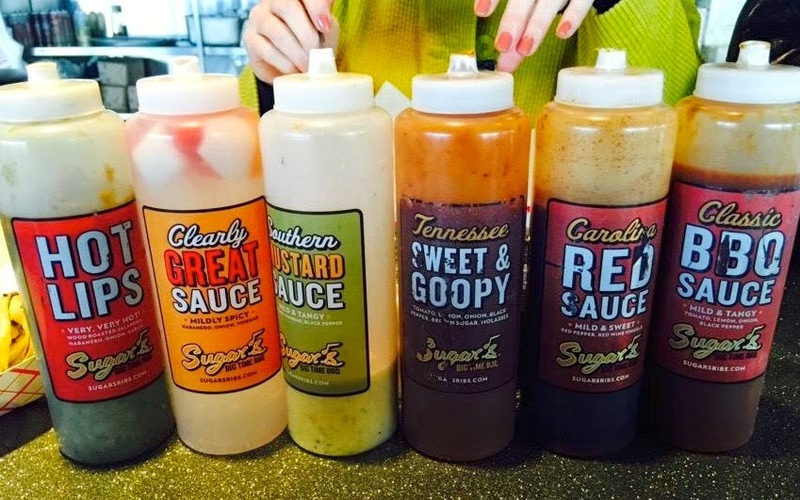 Sugar's is located right off I 24 E as you head through Chattanooga toward Knoxville. You can see Sugar's huge sign from the interstate, perched high on a hill right in front of the King's Lodge. I think King's Lodge used to be a nice place to stay back in the '80's but it looks pretty sketchy now. On this day, Luanne and I were in Chattanooga to visit with a sweet friend who was in the hospital. We were getting dinner for her family waiting at the hospital and having a bite ourselves as well. Since our friend's husband had requested barbecue, we thought this might be a good time to check out Will's suggestion. I have heard that Sugar's has a herd of goats outside the restaurant. Maybe the weather was too bad for the goats on the day of our visit, but we did not see them while we were there. We did however, smell the barbecue! Good golly! If you aren't starving before you pull in to the parking lot, you will be by the time you walk across the parking lot to the door! The first thing you do when you enter the restaurant, is place your order. Beware, the cute girl taking the orders has a wicked sense of humor. 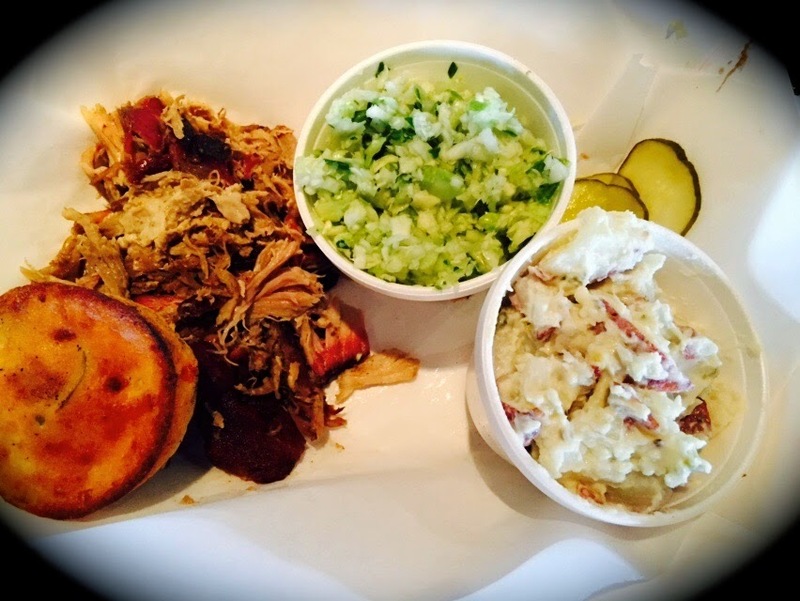 If you ask a question like, "What comes with the bbq pork?" You will get an answer like, "bbq pork!" Or, if you dare venture to ask, "What is the difference between the smoked jalapeños and the smoked peppers", she will, with a twinkle in her eye, say, "The smoked jalapeños are smoked jalapeños and the smoked peppers are not jalapeños." Trust me, we went back and forth like this for quite a while! We were all in tears from laughing so hard before we ever completed our orders. But, complete them we did (finally) and our hostess informed us that she would also be the one delivering our food. This seemed to be a one woman rodeo! I peeked to see if she was also in the kitchen smoking the jalapeños and the non-jalapeños, or if, perhaps, she was smoking something else! Just kidding! She was funny and personable and Luanne and I just love a good sense of humor. My meal consisted of pulled pork, vinegar slaw and potato salad, accompanied by a corn muffin, sliced onion, pickles and six large puddles of sauce. 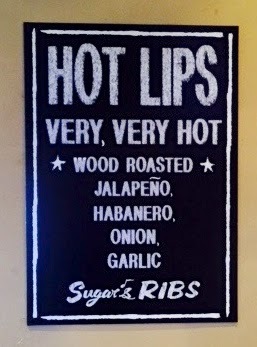 I loved it all except for maybe the sauces. I had a hard time finding one that suited me just right. I know...there were six of them. I should have been able to find one! Actually, the one I liked best was the oddest of all. It was a clear sauce with the name, Clearly Great Sauce. We decided to share a dessert. 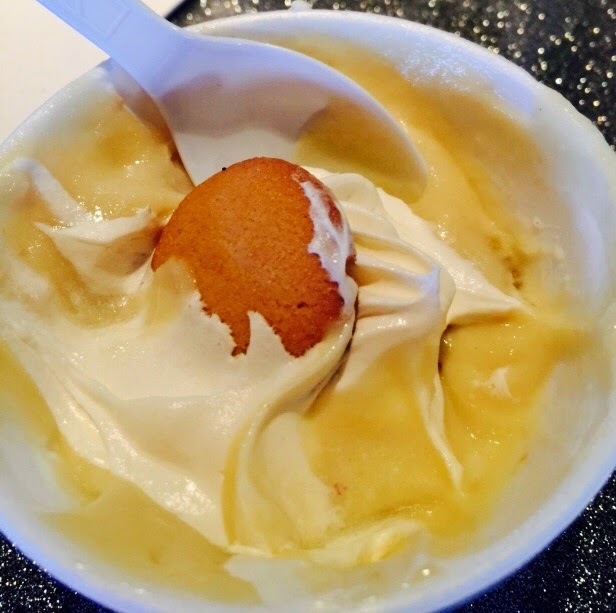 Our hostess/server informed us that the only in-house made dessert was the banana pudding, so we went with that. Just before our pudding was served, another friend called to check on our buddy in the hospital. I was giving her a report when our dessert arrived. I tried my best to get Luanne's attention not to destroy the pudding before I got a picture, but she was too fast or I was too slow. Either way, Lu tucked into the dang thing with the speed of light and this was the best I could do with the picture! I guess you could say, we liked the banana pudding! 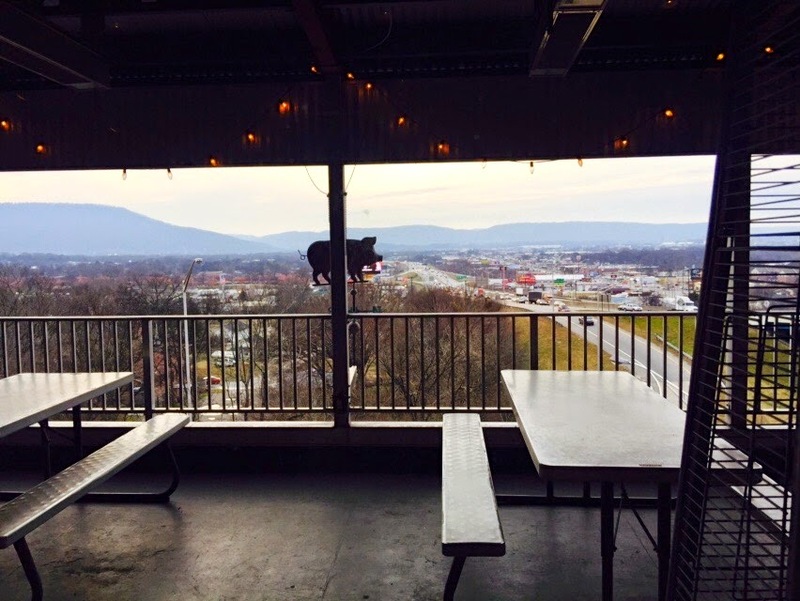 I stepped outside to the porch to get a snapshot of the view of Chattanooga overlooking the interstate. 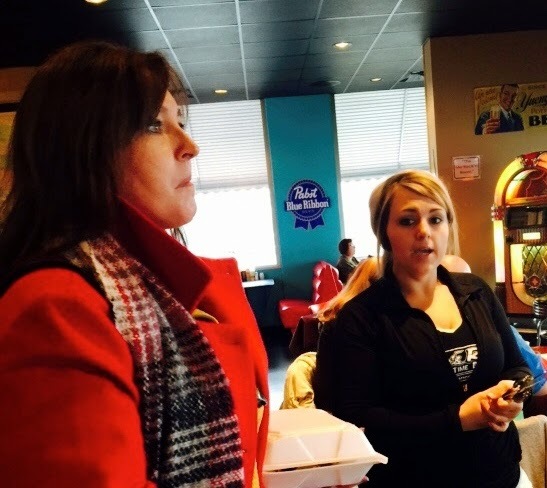 When I came back inside, Luanne was getting directions to a nearby convenience store from our snappy little waitress. With her sense of humor, you will have to forgive me when I say I wondered where we would end up! 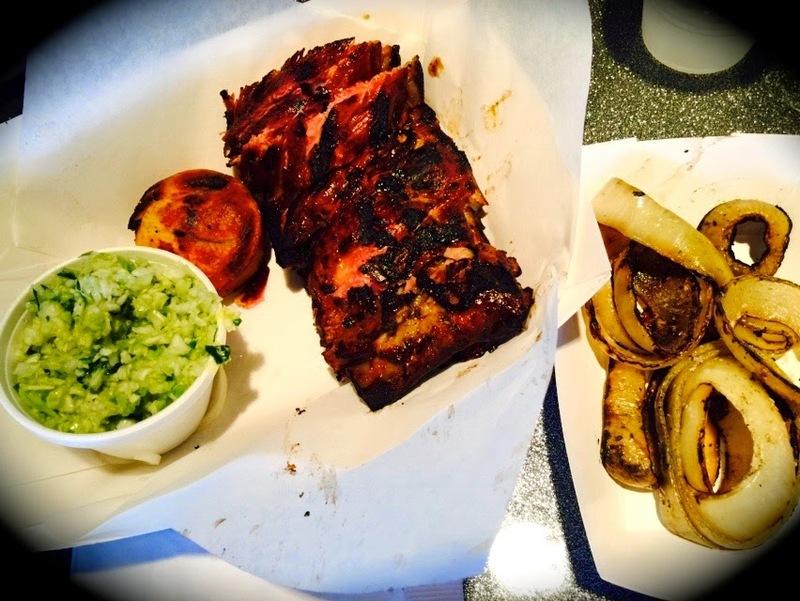 If you visit, Sugar's Ribs, be sure to tell our friend, "hello" from Three Friends and a Fork! 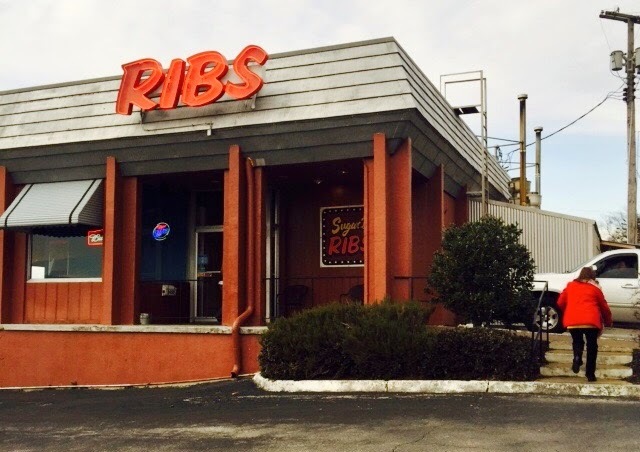 There are other locations of Sugar's Ribs around Chattanooga. We don't know about any of them except the 15th Avenue location and we will go back there. We want to try the smoked okra. We've heard it is really good. Until then, Three Friends and a Fork give Sugar's Ribs 3 sweet and smoky Yums UP. Thanks again, Will! Just had this again tonite for the second time in a week. Bought a bottle of each of their sauces. I might not be able to duplicates the excellent ribs but i hope my efforts will be aided by the excellent sauces. BTW, only one location now. 15th on the ridge. Thought I was lost until I spotted the goats. I too would have goats to mow that hillside. One of them would be named LawnBoy.